Investigations into widespread doping and match-fixing are underway in Australia and Europe, respectively. Match-fixing and doping have reared their ugly heads in the Asia-Pacific region once again. Last week, the European Union’s law enforcement agency, Europol, announced they were investigating 380 games of football in Europe on suspicion of match-fixing. Two Champions League matches and qualifiers for the 2014 World Cup are among the games being investigated. Just as worrying was a report by the Australian Crime Commission (ACC) released on Thursday, which claimed that the use of banned substances by teams and players was widespread in Australian sports, with links to organized crime. The report contained the findings of a year-long investigation. “The findings are shocking and will disgust Australian sports fans,” Justice Minister Jason Clare said at a press conference in Canberra. The report has sent shockwaves through the sports-loving nation. Details about the affected sports and clubs have not yet been released, and investigations are set to continue. Deputy CEO of the Australian Football League (AFL) Gill McLachlan admitted the possible existence of drugs being used in the sport though he denied that there had been any match-fixing. One club already undergoing a scandal of its own is Australian rules football team Essendon of Melbourne. 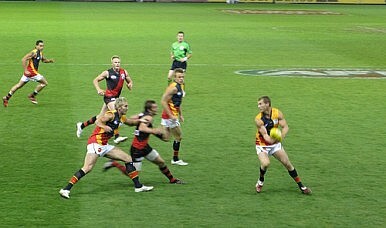 Aussie rules football is the most popular sport in the country. McLachlan revealed that the ACC report had identified "two specific cases where WADA (World Anti-Doping Agency) prohibited performance-enhancing drugs may have been used". He also admitted that performance-enhancing performance enhancing drugs banned by WADA could have been given to players at Essendon without their knowledge. "All possible instances of WADA-prohibited performance-enhancing drug use identified will be investigated fully in co-operation with ASADA (Australian Sports Anti-Doping Authority) to determine whether in fact there have been any breaches of the AFL's anti-doping code," McLachlan told reporters. Australian rugby is also thought to be affected. There are concerns, however, that the lack of details given by the ACC implicates everyone. "Nobody has been named, no club has been named and no sport has been named,” complained Phil Gould, general manager of Rugby League club Penrith. "It's a broad-brush condemnation of Australian sport everywhere. At the moment everyone is guilty and I'm not sure, even if they find pockets of illegality, how you repair the integrity of everyone else who is in fact innocent." Football (soccer) in Australia seems to be clean, but Football Federation Australia (FFA) CEO David Gallop is taking nothing for granted. Last Friday there were reports in the Australia media claiming that there had been $40 million bet on a single A-League match. Even Prime Minister Julia Gillard has become involved, telling pro sports organizations to keep fans in the loop. While this news is a hard blow for Aussie sports fans, they can at least take solace in the fact that an investigation is underway and the truth will soon come to light. Australian PM Julia Gillard Ousted, Kevin Rudd BackWorld Cup Hopes Hang in the Balance for Japan, AustraliaAustralian Men’s Swimming Team Admits to Stilnox UseShinji Kagawa’s Historic Hat-TrickJapan: A Football, Rugby Powerhouse in the Making?